Hawkeye 2 was something that original coder Mario van Zeist wanted to realise, with better graphics, sound and more added twists to the gameplay. It was going to be released under the Thalamus label, but was never completed due to some disagreement, which is not yet known. Hopefully more talks with Mario will clear this up. The game was never fully completed unfortunately. Music over the years was preserved and can be found in HVSC, written by Markus Schneider. We believe more tunes may exist somewhere. Thomas Heinrich came forward recently and confirmed that he and Michael Detert did graphics. Thomas Detert was also doing the music with Markus. After cancellation of the game, graphics were used in various titles such as Greystorm, Genloc and Darksword by X-ample Architectures. However in 2010, Onslaught managed to recover a large amount of remains of Hawkeye 2 from the developers, mostly in the shape of the graphics done for the game. But most shockingly with news of the sequel to be completed (More on this in a bit), with the teaser preview came an original preview done from 1989 of the original game and graphics. Think Hawkeye mixed with Deadlock, and you get Hawkeye 2, and it is a very promising demo with some superb graphics and paralax scrolling. As well as being left and right based, there are lifts in the game and small intersections. The game looked to be a large step forward in comparison to the first game. But this was all there ever was. We are proud to add a glimpse though after many years of hunting for it! But the best news has to be regarding Onslaught looking to produce a proper brand new Hawkeye 2 game, based on the graphics with a load of improvements and extras. The game is being written from scratch and features around 25 lines of parallax scrolling with plenty of CPU cycles left free. Check the preview out from here, but it looks superb! The game in total will have around 12 levels. "We have been working on it for some time, (I am project manager and have been overseeing level design and storyboard). 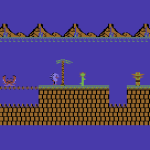 The game will feature 25-charline full colour parallax in both NTSC and PAL, obviously with some (very flexible) restrictions. It will hopefully feature 8-directional shooting, 32 sprites (might be scaled back to 24), delta sprite animation compression for long animation sequences of small pieces (think discharged bullets, muzzle flashes, reloading, etc), separate hair animation engine, based on jumping, changing direction, and wind sources. Of course there will be much more! While we did start from the original Hawkeye 2 development disks from the X-Ample guys, H2-new features a 100% rewrite, using far less memory and raster time to allow the game to go beyond just a simple shoot and collect. We’re all in full acknowledgment that good graphics do not cover bad gameplay; the gameplay has just as much design going behind it as the technical feature set. A website will arrive soon with further detail!" So overall, Haweye 2 never quite managed to grace our screens back in 1989 like we had all hoped, but it does now look like we could finally be seeing the game in some shape/form, and we have the original 1989 concepts as an added bonus! I love the first one, and this sounds absolutely awesome. Is there any new news and developments from onslaught?